At Xilloc, we believe that engineering and technology can be used even more in healthcare for the benefit of individual patients. “Personalized medicine” is a term often coined. We feel however, that this is not yet applied to implants and prosthetics, as these are mostly standard products, sometimes modified for an improved fit. Everybody is different and unique and therefore the human body and a patient’s anatomy should be the starting point for the design and engineering of individual implants and prosthetics. We feel that we can bridge the gap between the physician and individually engineered products. As such we aim to provide Patient Specific implants to reconstruct parts of the human’s skeleton. Through our customized and patient-specific products and services, Xilloc aims to assist surgeons helping their patients. Because patients deserve individual care. Back in 2003, the Department of Cranio-Maxillofacial and Plastic Surgery of the former Maastricht University Hospital needed a product to repair large skull defects easily during surgery that not only would fit perfectly on the defect, but also gave a safe and aesthetically pleasing result. Until that time, repairing large skull defects had been truly complicated by manually shaping, modelling and placing the implant. This resulted in long and complex operations with poor aesthetic results. In 2006, young biomedical engineer Maikel Beerens (aged 21) did his intership on the topic of “Custom-made Implants” at Maastricht Instruments B.V. and IDEE, the engineering department of the Maastricht University Medical Centre+ (MUMC+). In cooperation with the department of Cranio-Maxillofacial and Plastic Surgery, who had been working with custom-made implants from around 2003, they developed a method to preoperatively design and 3D print, patient-specific implants, based on a computer tomography scan of the patient. The first 3D printed titanium skull implant went around the world. Everyone in the medical additive manufacturing industry knows it. This kind of implants have been implanted very successfully ever since. For his thesis he was awarded the Fontys Technology Award, for best thesis in the Netherlands. Maikel started to dream. To take this innovative technology and make it available to surgeons worldwide. The young engineer sparked his entrepreneurial spirit and founded Xilloc officially in August 2011. 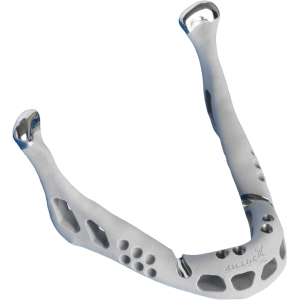 In that same year, Xilloc was at the base of yet another worldwide première; a 3D printed titanium complete jaw implant. And we are not going to stop innovating, so you will hear from us again in the near future!